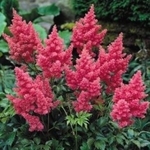 Astilbe arendsii 'Darwin's Dream' features unique, dense, rich pink flowers. The shiny, compact foliage is dark green. Due to its short stature and willingness to produce lots of flowers this plant is an excellent candidate for container growing. PPAF.